How often do colleges in America get sued for violations of the Americans with Disabilities Act? The U.S. Department of Justice (DOJ) received 6,391 accessibility complaints in the fiscal year 2015 – representing a 40% increase over claims in the prior fiscal year. Clearly, this is a problem that should be dealt with sooner, rather than later. ADA, the Americans with Disabilities Act, became law in 1990. This Act prohibits discrimination against individuals with disabilities in all areas of public life, including jobs, schools, transportation, and all public and private places that are open to the general public. This obviously includes public elementary and secondary schools. But it also affects post-secondary schools. According to the National Center for Education Statistics (NCES), approximately 11 percent of undergraduates reported having a disability in the 2007-08 and 2011-12 academic years, and an unknown number never officially declare them. It is an undeniable fact that colleges across the country have students with disabilities that require accommodations. Even though colleges are not required to accept everyone who applies, they are legally obligated to make accommodations for those students who need additional resources. And with all the wonderful technology available to us today, it’s easier than ever! Unfortunately, universities are facing an epidemic of lawsuits because they are not protecting themselves by making a plan for accommodations nor taking preventative action, preferring the “fix it once it’s a problem” philosophy. 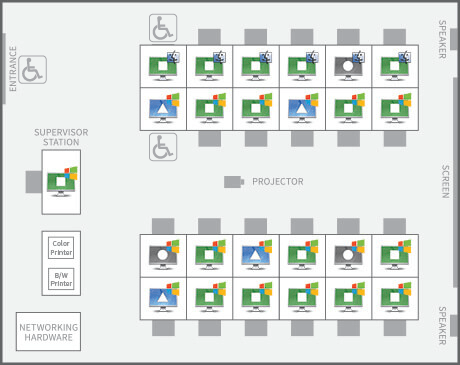 What accessibility personnel and lab managers need is a way to track and communicate the amount of accessible tech available at any given time on their campus. 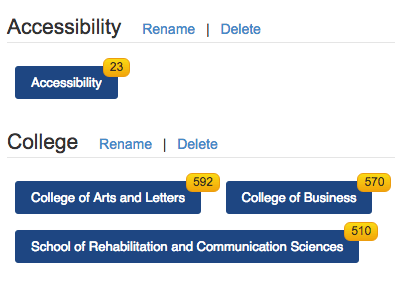 LabStats can help improve accessibility to campus IT resources with the tags feature and LabMaps. Within the LabStats software, you can identify accessible technology and then track it’s usage across campus. Tagging can be used to track students and their usage history, specific types of tech, and accessible software and hardware like wheelchair accessible computers, touch screens, speak to write computers, etc. Then you can run reports on who’s using them, how long they’re using them, and what they’re using them for. With this data in hand, you can make changes to better serve students with disabilities. If you see that the wheelchair accessible computer on the second floor lab is never being used by those who need it, you might consider moving it to the first floor. If the touch screen computers are almost constantly being used, it might be wise to invest in more. The idea is to be aware of your equipment and how that equipment is being used. You can also use the LabStats software to display accessible technology to students. LabMaps, a feature that displays a map of the computer stations available or in-use on campus, indicates where types of accommodation are on campus for users in need. A student who needs to have a private room to work in will need to know where to go; a student in a wheelchair needs an accessible desk; and a student with limited hand movement will need a mouse with a trackball for easier manipulation. Unless they know where these services are located and whether or not they’re available, those resources won’t be useful to them or the university. Students with disabilities deserve to have a college experience just like everyone else, and they need access to the correct equipment in order to do so. There’s a great opportunity to ensure every students’ needs are being accommodated while also making sure your school’s resources are being optimized. LabStats can help you.